Born in Greece in 1956 I read theology at the University of Athens. I pursued my studies at the postgraduate level at Holy Cross Theological School in Boston, USA, where I specialized in both theology and the aesthetics of Byzantine painting, gaining an MA in theology. In 1991 I was awarded my Doctorate in Theology at the University of Athens (1991), while in 2003 I was appointed to the post of Lecturer at the same university and later (2008) of Assistant Professor of Iconography at the same University, Faculty of Theology. In addition to lecturing and writing on Byzantine iconography at the academic level, I also taught the art of icon painting. I was teaching principally at the Department of Theology at the University of Athens, but in 2012 I retired. Visiting Positions: Yale University, Institute of Sacred Music, Visiting Professor, June 2004-2007; Art and Design University in Cluj-Napoca, Romania, Visiting Professor, 2005; School of Theology, Department of Fine Art and Conservation, Bucharest, Romania, Visiting Professor, 2006 and 2007; Holy Cross Greek Orthodox School of Theology, School of Theology, Boston, MA, Visiting Professor, 2006; South Ukrainian National Pedagogical University, Odessa, Ukraine, Visiting Professor, 2006; Orthodox Institute of Theology and Sacred Arts, St. Petersburg, Russia, Visiting Professor, 2008;University of South Carolina, Arts Department, Columbia, SC, Visiting Professor, 2011 and 2012; University of Notre Dame, Department of Theology and Institute for Church Life, 2013. During the 1980s I worked by the side of the Cypriot master iconographer, Fr Symeon Symeou. 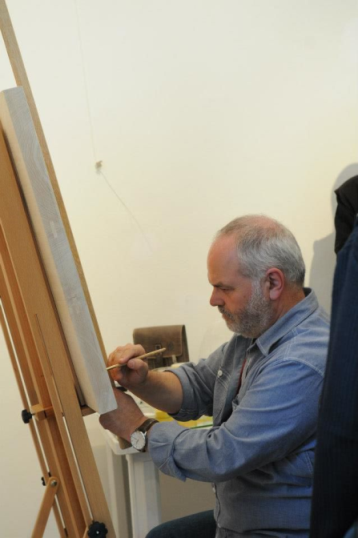 I also undertook courses in painting technique at The School of Fine Arts at The Museum of Boston from 1987–1989. 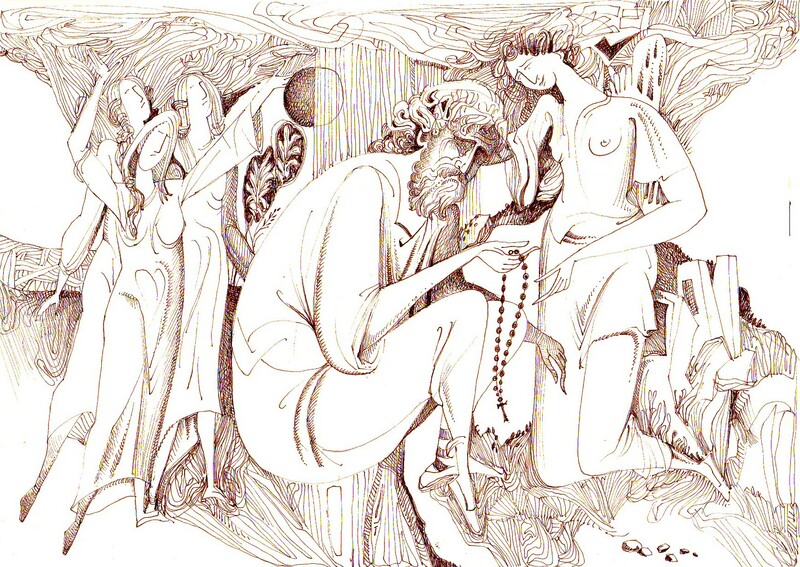 Upon my return to Athens in 1990 I continued my studies in painting and engraving under Fotis Mastichiadis. I paint icons as well as secular works. I have exhibited widely in my homeland and abroad. 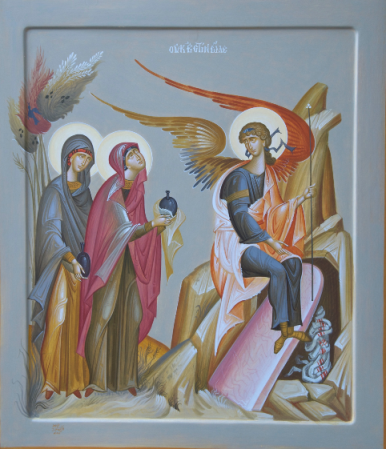 I have painted many portable icons and frescoes in churches and other holy places. My most important commissions include: Monastery of Docheiariou, Mount Athos, St George Cathedral, Beirut, Lebanon, Monastery of the Mother of God, Voiotia, Greece, Monastery of St. Anargyroi, Lakonia, Greece, Monastery of The Ascension of Christ, Voiotia, Greece, Church of the Annunciation, Beirut, Lebanon, St Nektarios Chapel, Athens, Greece, Church of the Transfiguration, Athens, Greece, Church of the Dormition of Mary, Athens, Greece, Church of St Nicholas, Beirut, Lebanon, Church of Presentation of Christ to the Temple, Athens, Greece, Holy Trinity Church, Columbia SC, USA. , St. Sofia Church, Valley Forge, PA., Holy Trinity Church, Carmel IN., Holy Trinity Church, Pittsburgh, PA., St. George Church, Fishers IN. What interests me is to show the metamorphosis of our everyday life through art. Thus I select my subjects from daily life and the relationships between human beings and their environment. I handle my subject in the Byzantine painting mode and try to recreate the ostensible natural reality, while expressing e.g. the isolation, separation and autonomy which characterize modern life. Everything in my work is linked together with love. What connects things is their rhythm and their movement. They acquire a common rhythm and are unified, abandoning their inactivity. And this concerns not only the drawing but also the colour of the picture, which is built by light. In this way the form is not retained on the painting surface, but is advanced towards the spectator and creates a relation with the viewer. This is the final aim of my painting. 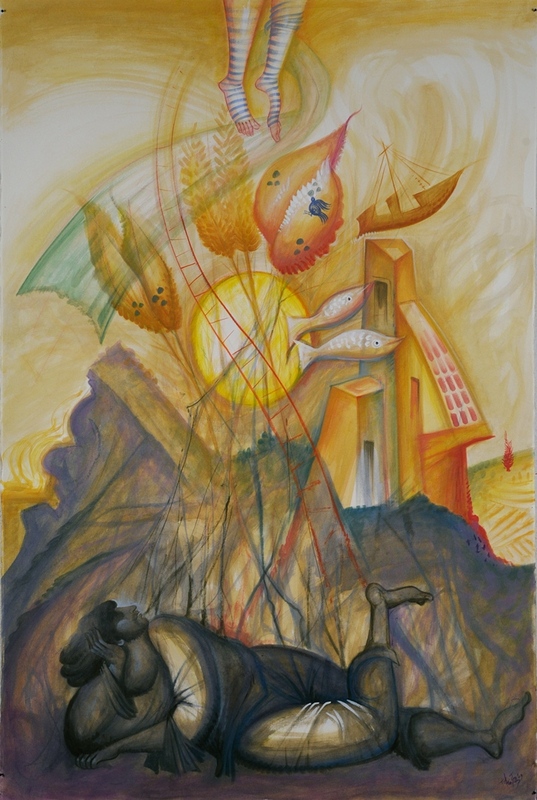 The figurative form ceases to be autonomous and is moved to the beholder, creating an aesthetic bond with him. It exists through him. The figurative form emerges into the present time of the spectator and lives through his own dimensions. I was taught this important truth by the Byzantine craftsmen, who, although for other reasons, sought the same thing in their work. 1.Temptations, ink on handmade paper, 19 x 30 cm. The fight of the human soul against temptations appearing always as beauty. 2. A vision, egg tempera on handmade paper on board, 100 x 150 cm. A vision of a world of beauty and light where the miracle is realised in everyday life. 3. 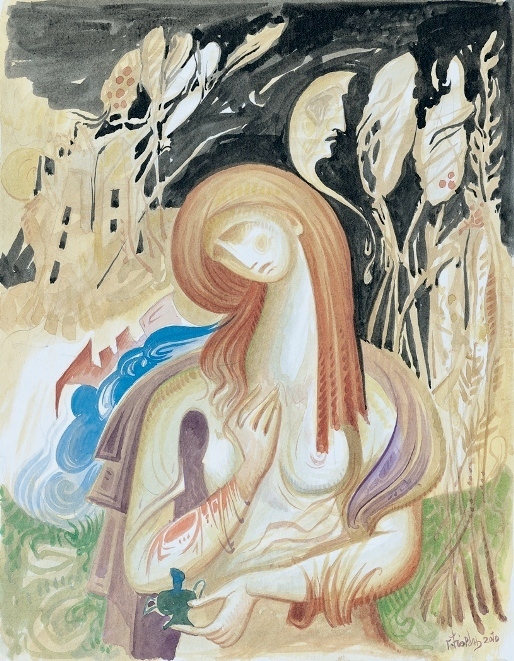 Myrrhbearer woman, watercolor on paper on board, 21 x 29 cm. The myrrbearer woman symbolizing the eternal love for life. 4. 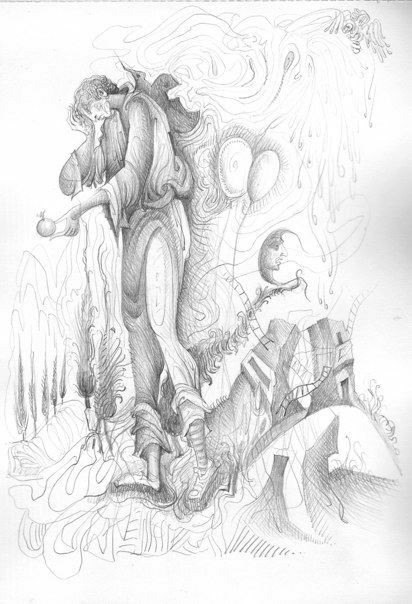 A traveler, pencil on paper, 21 x 29 cm. The adventure of the human soul traveling through the ages carrying his nostalgia for Paradise. 5. Freedom, egg tempera on handmade paper on wood, 40 x 50 cm. A personification of Freedom and Death. 6. 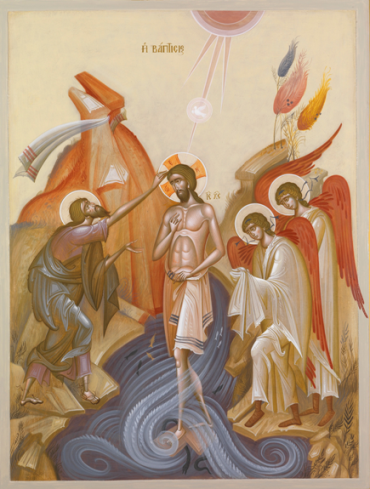 Baptism of Christ, egg tempera and guilded gold on wood, 55 x 75 cm. 7. 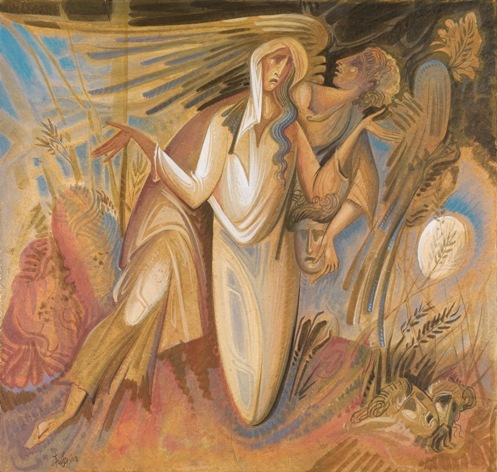 Anastasis, Myhrrbearing Women Arrive at the Empty Tomb, egg tempera on wood, 40 x 60 cm.